Dream Team (a learning circle in International teacher education 2013-12014 in Teacher Education College in Jyväskylä) is an international group of students studying to achieve the qualification of a vocational teacher. The Finnish Air Force motto, ”Qualitas Potentia Nostra – Quality is our strength”, has been the leading idea throughout its history. The number of aircrafts, weapons and personnel has never been very high if compared to other European countries. 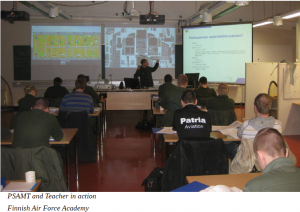 To counterbalance the limited amount of resources an innovative and high quality way of working has always been the cornerstone of the Finnish Air Force operations. A jet fighter is a very complex platform. The shift to the F-18 Hornet that was more modern than the previous fighters, the Swedish Saab Draken and the Russian MiG-21, by several fighter generations marked a quantum leap for the Finnish Air Force – especially for the technical personnel. To facilitate the learning of new technology required new thinking and modern teaching aids. 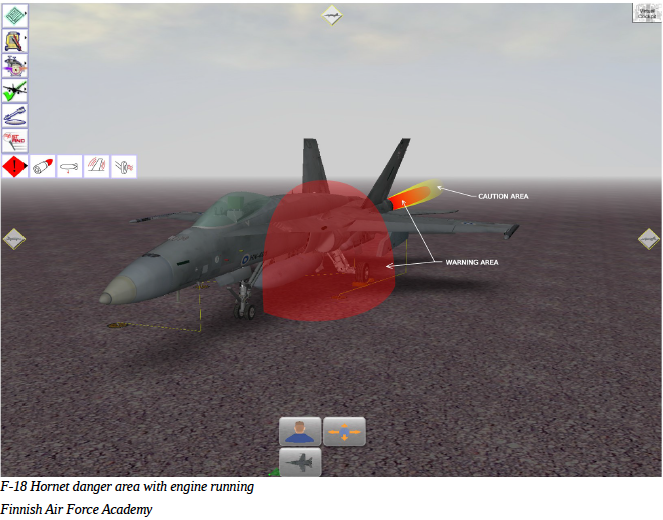 To meet the high-quality standards of modern education and aviation safety, creative virtual tools were introduced. 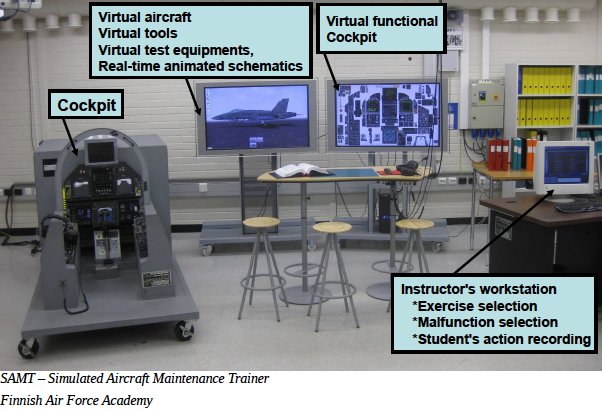 At the early stage of the F-18 Hornet technical personnel training a maintenance simulator was purchased. The first simulator was basicly an analogic modeling of the aircraft’s systems testing and troubleshooting. 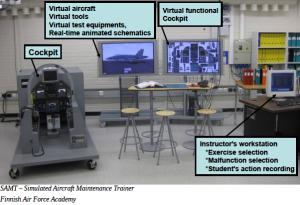 At the beginning of this millenium a new Simulated Aircraft Maintenance Trainer (SAMT) was introduced. 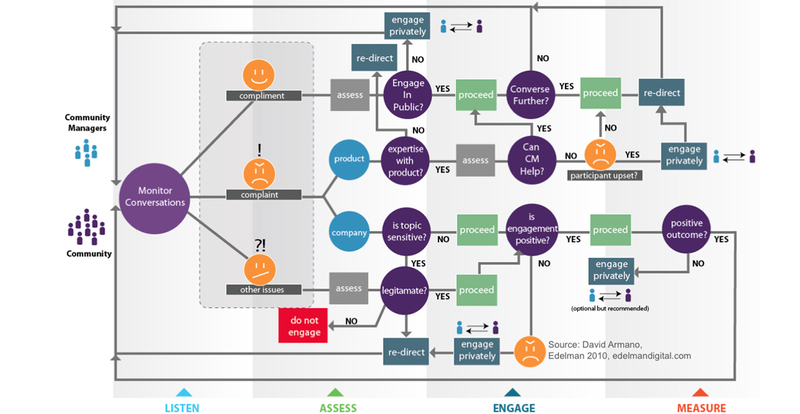 The new SAMT is a fully digital version with modern interactive simulations. It includes three computers controlling real size cockpit, two 52” displays, instructor’s workstation and the student’s interface. It mimics the real aircraft systems in various situations. In the basic operation the instructor chooses different system failures for repair. A group of students will follow the aircraft technical publication testing and troubleshooting steps to find the faulty equipment or electrical wiring to be replaced or fixed. The SAMT needs a special training environment to make use of it. It was not designed to be moved into different locations in the training unit. 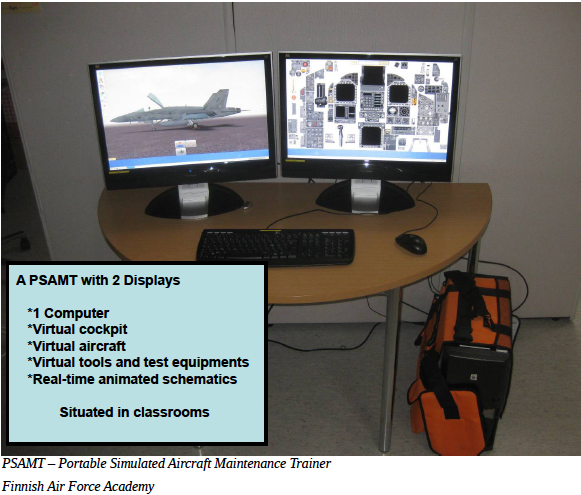 To make it more versatile a Portable Simulated Aircraft Maintenance Trainer (PSAMT) was evolved. The PSAMT consists of one computer and two displayes with user interface. It can be easily moved into different training environments. The simulation is equal to the full SAMT but doesn’t include the full size cockpit. 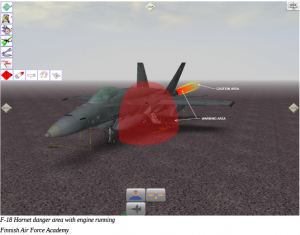 The PSAMT is nowaday s a basic tool for the training of the F-18 Hornet technical personnel. It is not just a teaching aid for aircraft’s testing and troubleshooting but a versatile tool to illustrate the various systems of the aircraft. 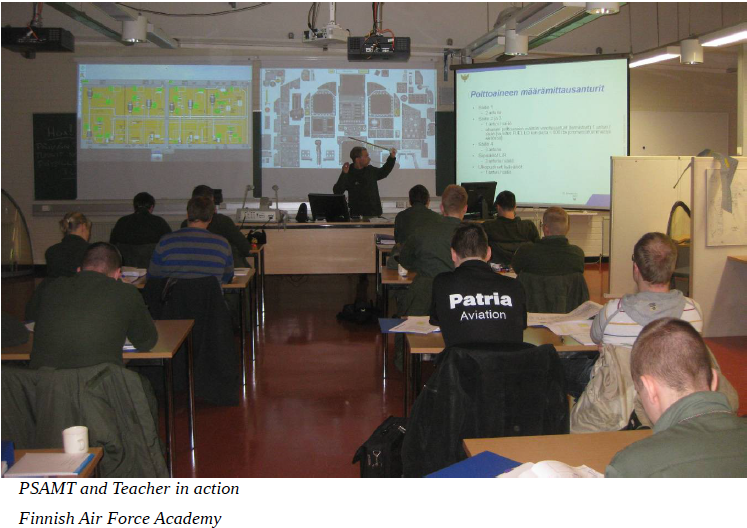 Aviation safety and safety at work have always been a vital issue in the Finnish Air Force education. Errors at work can cause severe accidents for personnel or huge financial costs by damaging an aircraft. A simulator is an economic and safe environment to monitor the student’s actions and mental attitude during training and avoid erroneous and dangerous measures with the real aircraft in the real life. By the year of 2016 the air to surface capability will be integrated into the Finnish F-18 Hornet. This is how the Finnish Air Force will prepare itself for the counter air operations by relying on a new stand-off weapon system. 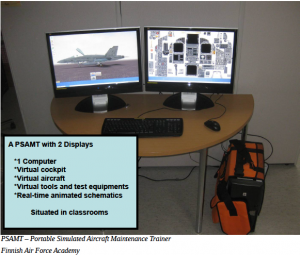 The SAMT and PSAMT is already fitted with updated software to meet the future challenges of teaching the new systems and keeping the personnel up to date along with the modified aircraft. Perfectmatch.com: how to evaluate and choose a good tool? Welhoja verkossa -verkkolehti on Jyväskylän ammatillisen opettajakorkeakoulun ylläpitämä. Sisällön tuottajina ovat Jyväskylän ammattikorkeakoulun henkilökunta. Sisällön käyttöoikeutta koskee Creative Commons -lisenssi (CC BY-NC-ND).